Not one to watch if your feeling a bit down. 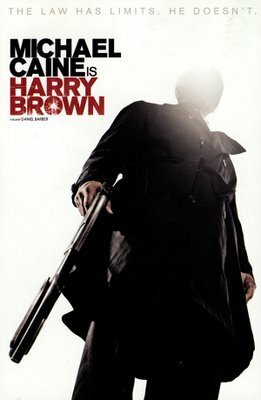 Michael Caine stars as Harry Brown in a dark, grime filled, dirty affair set on some rough looking council estate (Cue Sarf London even though I don't think it's mentioned). Harry kicks off on a revenge spree after his wife dies, his friend dies and he sees nothing but complete scum chavs running riot on his estate. It's a bit like Gran Torino meets Death Wish but never really hits the heights of either of those two. (Death wish is a classic in its own exploitation way). That said, like Gran Torino it does have the added realistic benefit of it's classy lead playing a character of his age. If it wasn't for the lack of humour, crappy plotted last twenty minutes and weak symbolism (yeah the underpass) then perhaps it might have challenged GT. Nah, not with that song as the credits roll. I gotta say, I prefered this to Gran Torino. But I've never seen Death Wish (working on it) so can't comment. Maybe it's the always surprising notion of discovering a British movie that's actually good AND stylish. That combination comes around so rarely...maybe I was dazzled? I also preferred this to Gran Torino. It had more balls and was grittier and nastier. And Caine was awesome. Gran Torino was pretty good but it went a bit too sappy at the end and the kid was a hopeless actor. Centurion - Why are you not entertained??? ?